Bettina Hutschek’s experimental documentary ‘CITY GATE. 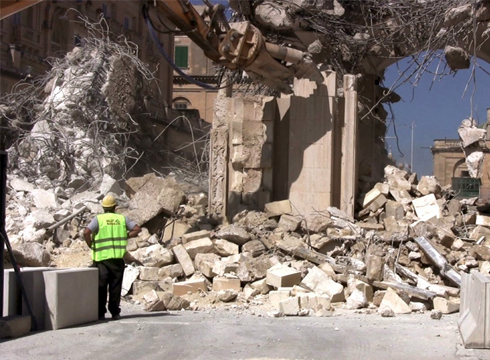 A diary of demolition’ will be screened at AP’s office between March 2nd and 23rd. The film was commissioned by AP to explore the formation of space not only through building, but also through removal. The film aims at understanding the interactions created and modified, at the various stages of the project, between the building, the public and the city. It shows, from various angles, the successive removal of the gate, and provides a subjective approach to city memory and oblivion that establishes a historic link between Valletta’s past and future. This project was made possible through the support of the Malta Arts Fund, Telesystems, Steel Structures and BIB Joint Venture.